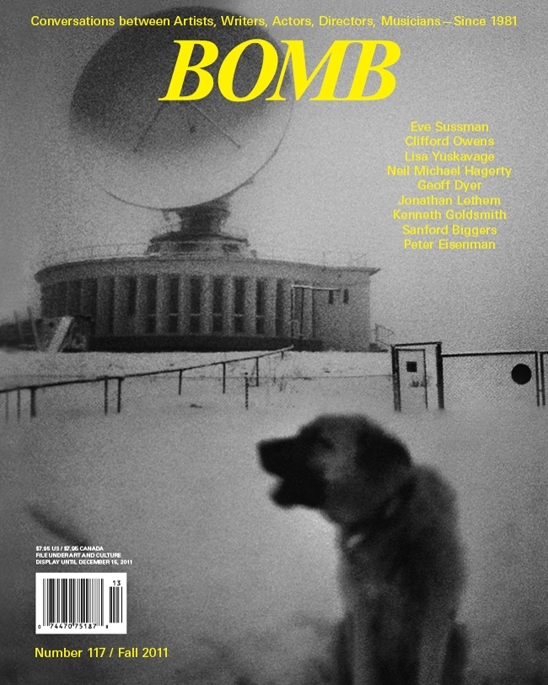 I have an in depth interview with conceptual poet and UbuWeb founder Kenneth Goldsmith in the latest issue of Bomb magazine. You can listen to audio from it and read an excerpt here. Here’s the intro to the piece for those who are curious: “”Kenneth Goldsmith is a trickster for sure, not just because his work takes place on the crossroads between legal and illegal, between digital and real life, between word and image, but because he’s a man who wears a lot of hats, metaphorical and otherwise. He’s the founder of UbuWeb, the largest archive of avant-garde art on the Internet, and an incredibly rich and dense resource for anyone interested in the history of experimental writing, music, film, and visual arts. He was a radio DJ on WFMU for many years, producing a prank-heavy show of experimental horseplay called Unpopular Music . He’s a professor of creative writing at the University of Pennsylvania, where he teaches courses on what he calls “uncreative writing.” He’s a visual, sound, and text-based artist and poet, author of a number of remarkable books, including No. 111 2.7.93-10.20.96 (1997), Day (2003), the radio-appropriation trilogy The Weather/Traffic/Sports (2005–08), and is currently working on a history of New York in the 20th century built around Walter Benjamin’s Arcades Project . His new book, Uncreative Writing: Managing Language in the Digital Age , sets out much of the thinking behind these projects and proposes a manifesto for writing in the 21st century, while the recent collection Against Expression , co-edited with poetics scholar Craig Dworkin, brings together key literary texts that enact what Dworkin and Goldsmith call conceptual writing—writing built around specific processes of experimentation (i.e., concepts) rather than the demand for self-expression.